If you are looking to pack on a few kilograms, a quality weight gainer can make all of the difference in the world. Mega Mass 2000 has existed for more than 20 years and is one of the most popular dietary products. How does this powder rate in terms of taste, quality and performance? Our tasters have done the work so that you do not have to. Let’s look at a breakdown of this supplement. Weider is a quality supplement provider, so we first should mention that Mega Mass 2000 is one of the oldest weight gainers on the market. Having said this, each serving (four heaping scoops) will give the user 50 grams of protein, 61 grams of carbohydrates, 400 calories and only 7 grams of fat. It is available in numerous flavours such as chocolate-chocolate chip, banana and peanut butter. Our panel used numerous varieties to determine the overall taste. 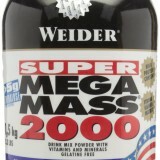 On the positive side, Mega Mass 2000 boasts numerous vitamins and minerals. 15 per cent of the recommended daily allowance of iron and 30 per cent of magnesium are offered. It is also a great value for the price. According to the official Weider website, 8.6 pounds (4 kilograms) costs approximately GBP 40. Unfortunately, the taste of all flavours leaves much to be desired. The chocolate is quite strong and variations such as banana and vanilla are characterised by a rather “chalky” feel. It is also difficult to mix within milk, juice or water. While even the instructions state that an electric blender should be used, our experts discovered that the powder quickly settled back out after only a few minutes. Some found the thick mass at the bottom difficult to swallow. While the vitamin and mineral profile is impressive (particularly the levels of branched-chain amino acids), this is still quite far behind some of the most cutting-edge weight gainers. 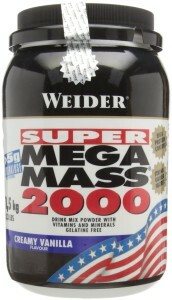 If you are looking for an affordable and moderately effective weight gain powder, Mega Mass 2000 may be a good choice. However, you are better off choosing a more modern brand should you desire the latest in supplementation. One product we recommend is USN Hyperbolic Mass.